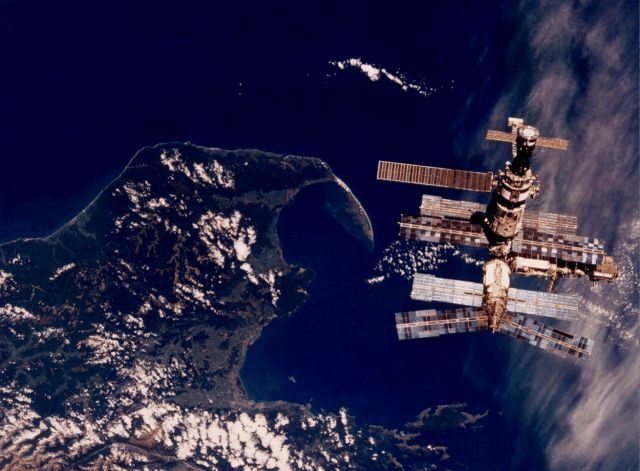 Explanation: This dream-like image of Mir was recorded by astronauts as the Space Shuttle Atlantis approached the Russian space station prior to docking during the STS-76 mission. Sporting spindly appendages and solar panels, Mir resembles a whimsical flying insect hovering about 350 kilometers above New Zealand's South Island and the city of Nelson, near Cook Strait. In late March 1996, Atlantis shuttled astronaut Shannon W. Lucid to Mir for a five month visit, increasing Mir's occupancy from 2 to 3. It returned to pick Lucid up and drop off astronaut John Blaha during the STS-79 mission in August of that year. Since becoming operational in 1986, Mir has been visited by over 100 spacefarers from the nations of planet Earth including, Russia, the United States, Great Britain, Germany, France, Japan, Austria, Kazakhstan and Slovakia. After joint Shuttle-Mir training missions in support of the International Space Station, continuous occupation of Mir ended in August 1999. Mir is still in orbit and its operation is now being pursued by commercial interests.